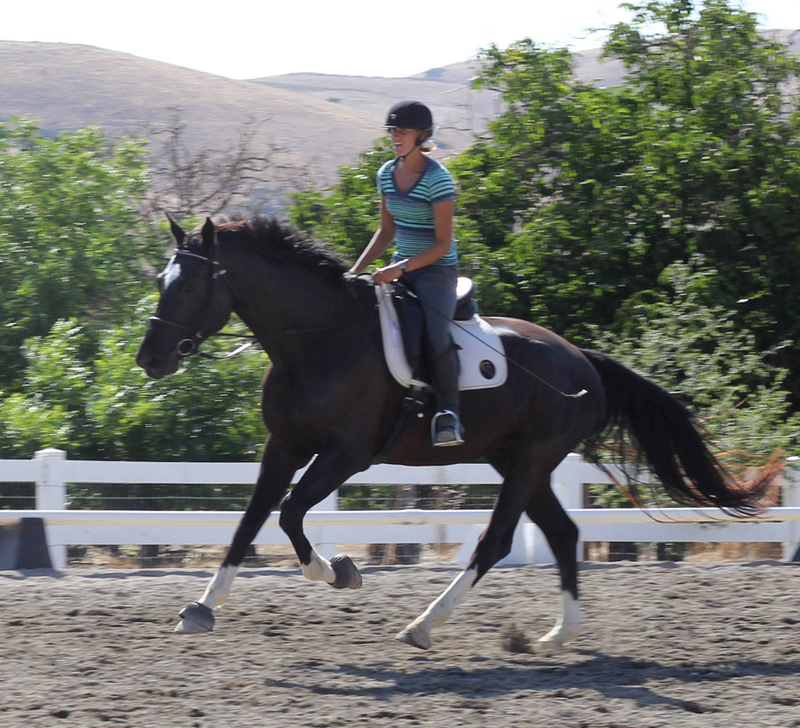 A true canter is a 3-beat movement plus a moment of suspension. It is also known as the “rocking horse” stride because the nature of the gait causes the horse to rock up and down from head to tail. 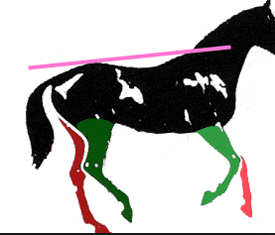 The line of horse figures below show the canter moving to the right on the right lead at each beat or phase of the stride, and gives us the opportunity to parse the gait a little. 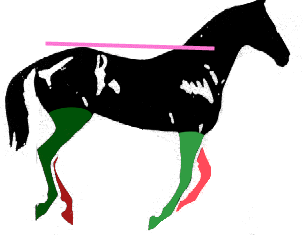 The first figure shows beat 1 as the outside (left) hind leg hits the ground first, initiating the stride. The second figure shows beat 2 as the inside (right) hind leg and outside (left) foreleg touch the ground together. The third figure shows beat 3 as the inside foreleg touches the ground, leaving the other three in the air. 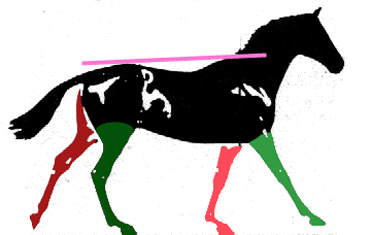 The fourth figure shows the moment of suspension (all four feet off the ground), completing one canter stride. The last figure shows a return to beat 1. 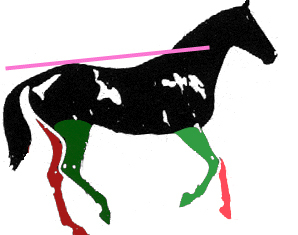 The pink line over the back draws attention to the up and down rocking motion of the canter. (Images were taken from the website http://www.sustainabledressage.net/rollkur/why_not2.php). 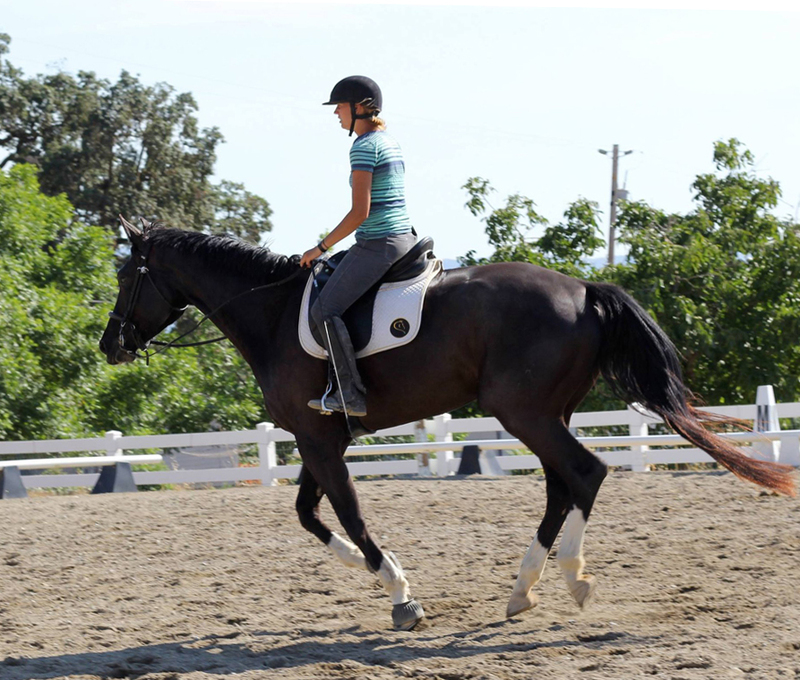 To view this in real life, the next 3 photographs show Devon, a 5-year-old Hanoverian, being started under saddle. He is moving to the left on the left lead. 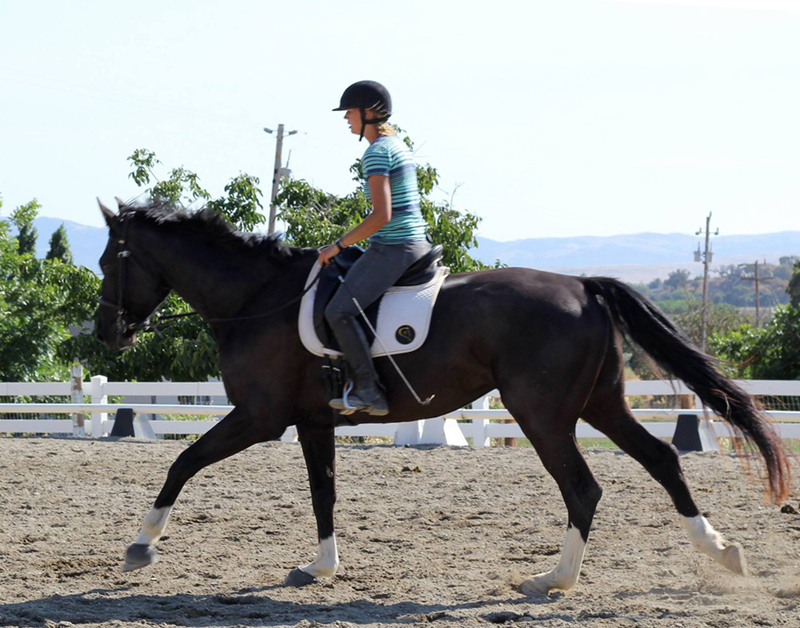 The canter stride is initiated by the outside (right) hind leg striking the ground first, and his entire front end (legs and all) is elevated or rocking upward. It is also common for the rider’s torso to lean forward at this point in the stride as Stephanie is doing here with a little exaggeration, encouraging Devon to move in an unrestricted way. 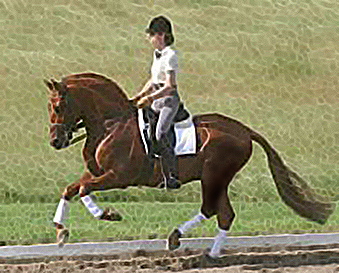 The second beat of the canter happens when both the inside (left) hind leg and the outside (right) fore leg — or diagonal pair — strike the ground at the same time. You can see how Devon’s topline is now parallel to the ground. At this stage in his training he is not being asked to gather or collect his body, but to move with energy and intent, allowing him to develop the reach and scope of his stride, strengthen his joints, and tone muscle. We can also see the concussive nature of forward movement by how his diagonal pair of fetlocks press toward the ground on impact before springing back into alignment when the leg is in the air. Professional photographs are often taken of the canter at this phase because the horse is level and usually appears more animated. Notice how Stephanie’s torso is now a little more upright with her seat softly in the saddle. In other words, the rider will tend to rock forward on beat 1 and rock toward the rear on beat 2 and 3, and then begin to rock forward again at the moment of suspension in order to absorb or “swing” in harmony with the movement. 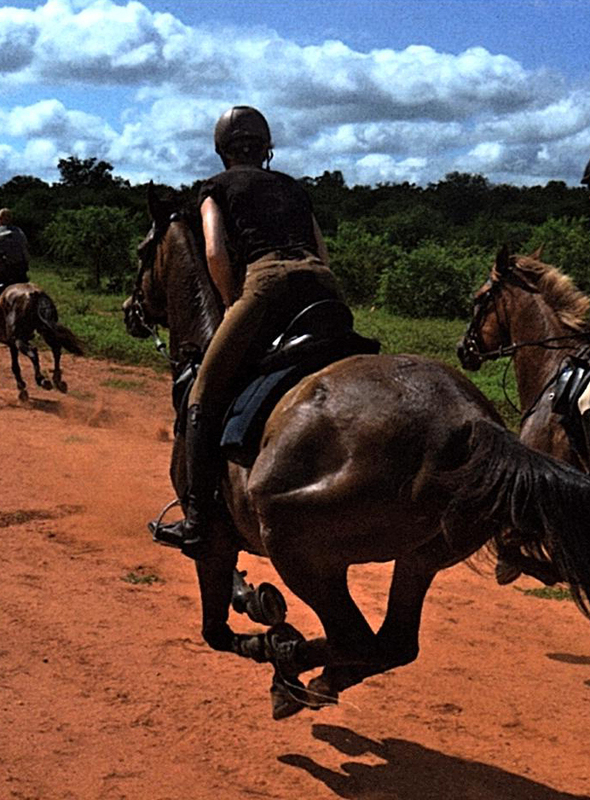 The third beat of the canter occurs when the inside foreleg touches the ground while the other three remain in the air. Devon’s front end is now at its lowest point, or rocking downward, and his rump is more up in the air and slightly higher than his withers. Notice Stephanie’s torso a little farther back, although not much at this stage of his training because her primary aim is to achieve freedom of stride, not collection. Later on, as Devon strengthens and learns to bend his hocks in order to carry more weight to the rear, he will be able to go from one phase of the canter to the next without so much of a rocking sensation. In other words, his legs will express more animation while his topline remains more parallel to the ground throughout all phases of the stride. I did not have a photo of Devon during the final phase of the canter, but the one to the right clearly shows all four feet neatly tucked off the ground in this horse’s “moment of flight” or “moment of suspension.” Although our viewing angle is different, we can still see the horse’s topline parallel to the ground as it was with Devon on beat two, and because this horse is moving at quite a pace cross country, the rider is in a forward seat position as well. 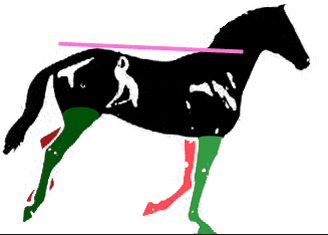 This horse is moving in a straight line, neither to the right nor to the left as was Devon, but he is still on the right or the left lead. Do you know which one it is, and if so, how can you tell? Because I made a referral to collection and how that changes a horse’s way of moving, I thought it would be informative to post a comparison between young Devon at beat 1 of the canter stride on the left below, and a more highly schooled dressage horse in collection on the right, also at beat 1. Note how the schooled horse animates the motion of his legs and bends his joints, giving the appearance of “sitting” as the hindquarters bear the brunt of his weight. As a result, while his front legs are lifted off the ground the same as Devon’s, his topline is more parallel to the ground. The rider, too, will be sitting more upright throughout the stride as the horse’s center of gravity is farther toward the rear. I’m SO glad you are my teacher! And, knowing you as a friend is pretty damn cool, too. Thanks, Adelheid! Love you back.